It was the First of the Skies who singed his feathers. 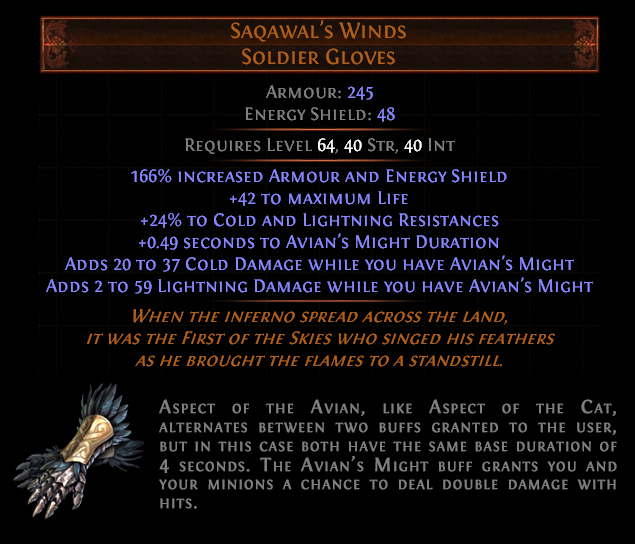 A unique with halfway decent stats? What sorcery is this? Also is the %chance to deal double damage finalized yet? Would be nice to know that %. Okay, but what do Crab Barriers do? Is there any info on what avians might does? When you activate the Avian or Cat aspect, do you always get the first buff for four seconds immediately after you activate the aspect? Or are the buffs on some sort of "background timer" that keeps ticking whether you have the aspect active or not, and it gives you whichever buff is "due" at the time of activation? In other words, is it possible to keep the aspect inactive, and if I decide that I want the dodge chance / crit / double damage right now, turn the aspect on and get the buff for the next four seconds deterministically, like a flask effect? How much mana these new "aspects skills reserve" and why you can have just 1 aspect skill at the time. Starforge shock berserkers just died and went to bird heaven. How does this stack with heavy blow's threshold jewel? Like other aspect based unique items, this one does not gives you any auras unless you craft them on other pieces of gear. The deff stats are worrying weak.